Black mold is a serious problem in many homes. It can cover walls and ceilings exposed to too much moisture. According to the University of Minnesota, infants are especially susceptible to the effects of black mold and can develop more severe symptoms. Mold is a toxin and can be a serious threat to an infant’s system. 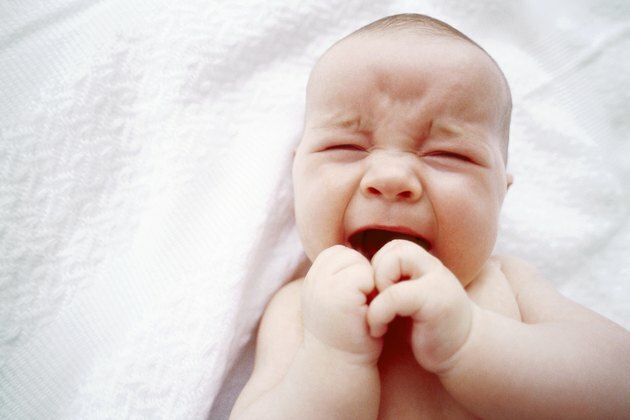 An infant can exhibit several different symptoms. Because an infant’s respiratory system is immature, his body can't rid itself of the toxins that molds give off. According to Ohio Link, visible mold is a risk factor for respiratory illness and wheezing. The wheezing can recur and be frightening for the infant and family. An infant may also suffer from coughing and may even have some difficulty breathing or catching his breath. In addition, black mold can cause respiratory illness such as pneumonia in severe cases. Lung problems in an infant can be a serious health risk. A physician must evaluate the infant immediately. According to Susan Lillard-Roberts in an article on Mold Survivor, an infant exposed to black mold may suffer from gastrointestinal problems. These problems may include nausea and vomiting. A young infant may refuse to eat and may lose weight as a result. In addition, Lillard-Roberts reports that an infant may also suffer from diarrhea and abdominal pain. These symptoms may last for short periods and return but can also last for longer periods. The longer diarrhea, nausea and vomiting last, the more risk there is of the infant becoming dehydrated. This can be a life-threatening medical condition for an infant, and a physician should evaluate the baby as soon as possible. According to the University of Minnesota, skin irritations or rashes can occur on the skin of an infant exposed to black mold. Often, the infant’s skin is directly exposed to the black mold, but this is not always the case. A red, bumpy rash can develop on the child’s body. The rash may be painful or irritating. Creams for rashes that you would normally use aren't useful. This rash may sometimes be mistaken for a diaper rash if it occurs in the diaper area. However, if the rash occurs in other places, consult your physician. What Are the Dangers of Mold in a Basement? What If There Is Black Mold in Walls?